An excellent choice for rock gardens, front borders and along paths, this low-growing ornamental grass adds color and movement to the garden. Flower heads open above the green-blue foliage in early summer to midsummer. Growing 10 in. tall with a similar spread, this easy-care, perennial grass grows best when planted in well-drained soil. Ornamental grasses are easy, low-maintenance ways to add movement and color to flower beds and landscapes. They can be planted with other ornamental grasses or in mixed perennial beds. 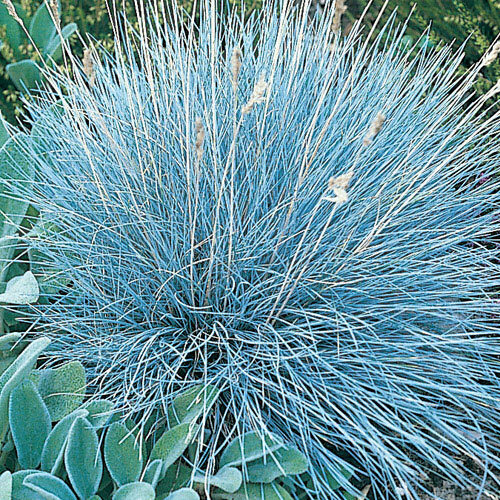 Blue Festuca Grass is drought tolerant, once established. Deer tend to avoid. Prefers full sun. Zones 4-8. Soil RequirementsWell-drained, somewhat dry soil. Growth RateSlow growth first season; moderate thereafter. CommentsAn excellent choice for rock gardens, front borders, and along paths, this low-growing grass adds color and movement to the garden. Flower heads open above the green-blue foliage in early to midsummer. Prefers full sun. DepthPlace in hole 2 times as wide & deep as pot. Top of root ball at soil surface.